A collection of tables designed by architect Hans Bølling in the 1950s but never produced has launched at IMM Cologne, which began today. As the table never went into production, the collection's launch at this year's IMM Cologne marks the first time they have been available to purchase. "We've worked with Hans for three generations," the Brdr. Krüger's creative director Jonas Krüger told Dezeen. "One day he was at my workshop and it was time for us to move forward into new furniture, and I asked if he had any ideas." "He had a very rough prototype he made when living with his parents in 1958, and it had been in his shed since then." 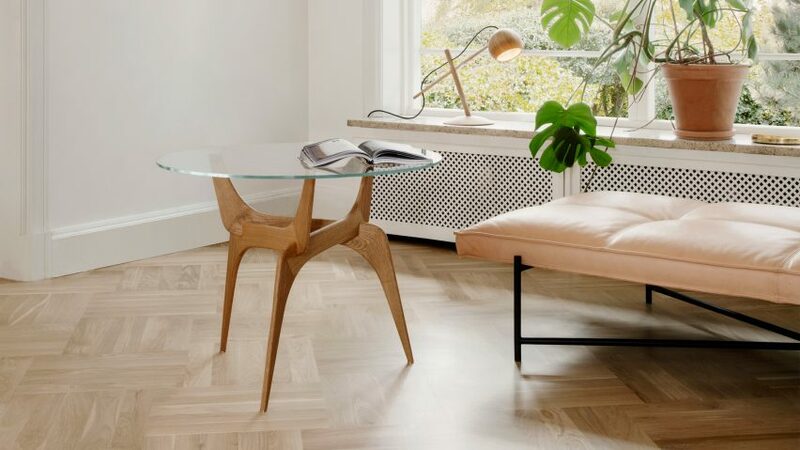 From this prototype and Bølling's original sketches, the company developed three versions of the table. "We followed his original drawings but added a finish to it," said Krüger. "He designed it with a hardwood tabletop, which I thought hid the design underneath." "We decided for the glass tabletop that we needed a way to fix it, and chose brass – although it was a little difficult to work with. We added hidden magnets, which goes inside the legs and are strong enough to move it around without anything happening." Hans Bølling was born in 1931 in Braband, Denmark. He first attended an art school hoping to become an advertising designer but later graduated as an architect from the Royal Danish Art Academy. The Triiio table collection is launching at IMM Cologne, which takes place from 16 to 22 January 2017.